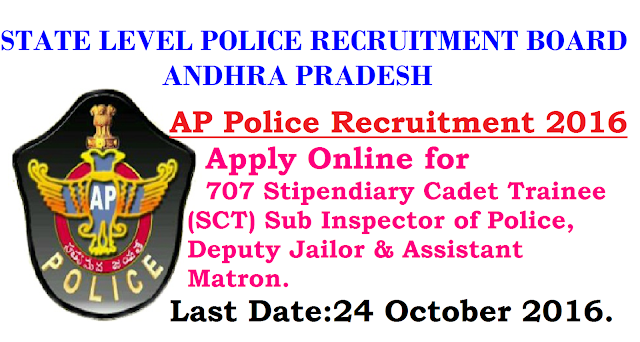 State Level Police Recruitment Board, Andhra Pradesh invites Application for the post of 707 Stipendiary Cadet Trainee (SCT) Sub Inspector of Police, Deputy Jailor & Assistant Matron. Apply Online before 24 October 2016. Educational Qualification : Degree awarded by any university in India. In the case of a candidate belonging to Scheduled Castes or Scheduled Tribes, as on 1st July, 2016, he/she must have passed Intermediate or any other examination recognised by the State Government as being equivalent to Intermediate and should have studied Degree. Selection Process: Candidates will be selected based on Preliminary Written Test, Physical Measurements Test (PMT)/ Physical Efficiency Test (PET) & final written examination. Application Fee: Candidates have to pay Rs. 600/- for OCs/ BCs & Rs. 300/- for SCs/ STs towards Applications Processing & Examination through Mee Seva (e-Seva)/ AP Online/ TS Online in favour of Chairman, State Level Police Recruitment Board, Andhra Pradesh. How to Apply AP Police Vacancy : Interested Candidates may apply Online through the website recruitment.appolice.gov.in from 23.09.2016 to 24.10.2016.